Scientists from Arizona State University (ASU) have published the first paper based on data from the Mars rover, Curiosity. This article has been written on the density of the planet beneath the surface. It may translate into a picture of what produced mysterious sediments found in a certain region of Mars. These sediments may be the remains of a lake that may once have existed in the general locale Curiosity inhabits today. Previous readings on this subject have suggested that this would give what now remains of the ‘lake,’ as well as the rocks above it, a certain level of density. It seems Curiosity’s data has resulted in a re-evaluation of the figures in question, and that this terrain is actually less dense than previously thought. The ASU researchers obtained their data in an innovative, indirect fashion. They realized that Curiosity was sending gravitational readings back to Earth along with the rest of its more mundane, 'housekeeping-type' telemetry that its engineers used to make sure it remained fully operational while on the Red Planet. However, the scientists were aware that Mars’ “pull” on the rover was obviously measured as it travelled through the rocks and sediments. Therefore, the routine gravity readings were calculated in the context of the mineral content of the same Martian surface. This data was also collected by the rover’s Chemistry and Mineralogy instrument, intended to get an idea of the density of the rocks and other underground features immediately beneath the robotic vehicle. However, the ASU team asserted that they could obtain more accurate data by including gravitational data in the relevant equations. Accordingly, the researchers were able to “measure the bulk density” of what Curiosity found underfoot as it traversed through the Gale Crater. 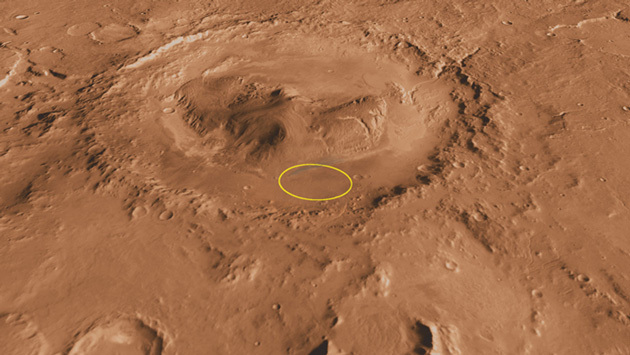 The rover was set to visit this crater as it is a typical example of a Martian feature that may have been created as a result of a collision with a body such as an asteroid. These impact craters have a central ‘peak’ that may be a further indication of the strike that created the natural bowl in which Curiosity found itself. This elevation, known as Mount Sharp, was also to be a focus of Curiosity’s evaluations, as scientists wished to gain a better idea of its composition and origin. 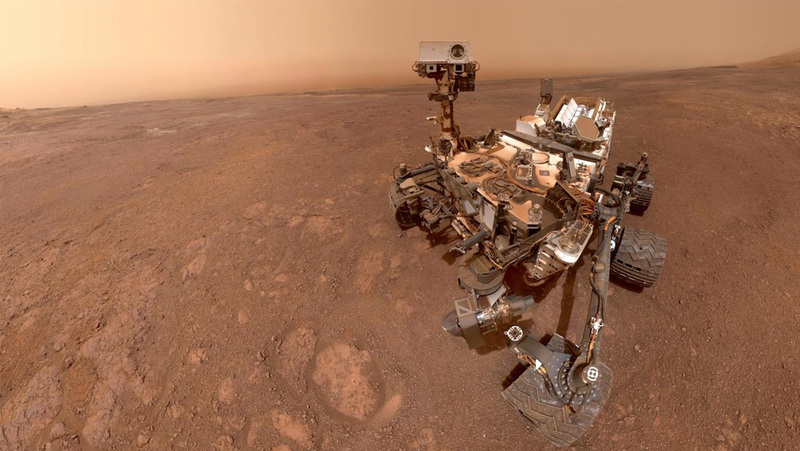 Curiosity’s Chemistry and Mineralogy telemetry initially let the scientists who analyzed it to conclude that the bulk density found in the Gale crater was 2,810 kilograms per cubic meter (kg/m2). However, the ASU’s results diverged from this figure. They found that their new technique resulted in a value of 1,680 kg/m2. This suggests that the layers of rock under the surface of Gale are much less dense than previously thought. Therefore, the ASU team’s paper, which was published in Science on February 1, 2019, has concluded that these rocks may, in fact, be much more porous than previously thought. This may be an interesting revelation in terms of the crater’s formation, and the overall history of Mars. Curiosity’s further forays nearer to Mount Sharp also revealed some unexpected data. A different group, from Johns Hopkins University this time, reported that this peak was indeed made of the same rock as the crater – up to a point. In its higher reaches, Mount Sharp appeared to be made of the sediments that may have made up a lake in the earlier days of the planet. This led to a re-thinking of earlier theories that state Gale Crater was once completely filled with this sediment, which then eroded away over time with the wind. 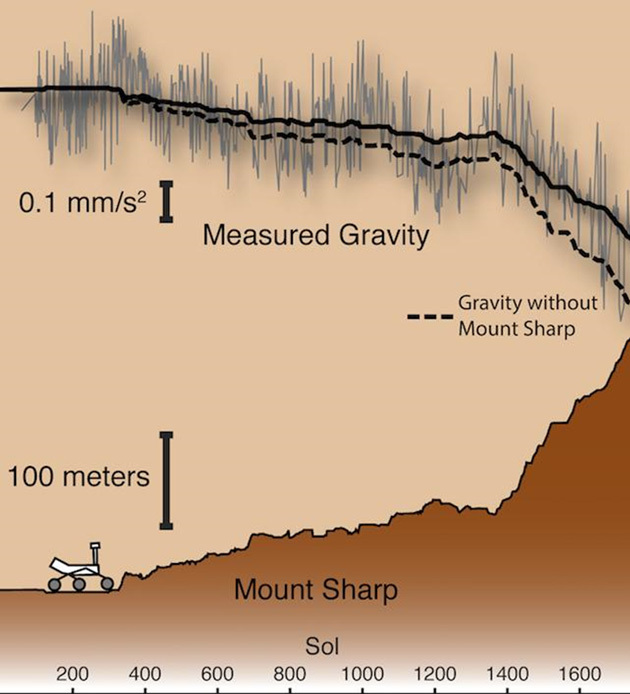 However, for it to hold up, this theory also requires that the entirety of Mount Sharp’s rock would have to be denser compared to the rock layers of the crater floor. The Johns Hopkins researchers reported that the peak was compacted in an expected manner, but only by about 0.5 to 1 mile into its slope, not all the way up to the top. This suggests that the crater may have been only partially filled with sediments at one point. How did the ASU Team Revolutionize Density Readings on Mars? The Arizona researchers were able to obtain their gravitational readings by assessing the telemetry from Curiosity’s accelerometer arrays. It was made up of a particularly sophisticated variation on conventional accelerometers, even those found on our smartphones. As Curiosity moved, this array sent data on its speed at 700 different points along its tracks. However, when the rover stopped moving, the accelerometers kept working. This resulted in the generation of data on the gravitational effect of Mars in a highly localized, accurate manner. When combined with the mineralogical data in the manner developed at ASU, it gave a bulk-density reading that may now be incorporated into Curiosity’s further work, as well as those of other similar upcoming missions, in the future. In addition, it is interesting to think that next-generation mobile devices may be capable of such analysis, especially if some of us really do get to Mars in the coming century!